Much of the world is talking about motherhood today in view of the impending arrival of the next member of Queen Elizabeth’s family. Having given birth three times, I hope that things are going well for you, Kate. Even when it goes well, it isn’t an easy process going from awaiting a child to being the mother of a child. And now that I’ve been a mother for something like thirteen years and two and a half months, one thing is more certain than ever before: I am becoming more and more like my mother every day. So many times I catch myself saying something and it’s like my mother is in my head, speaking again. I was helping my daughter work on a project yesterday and it was as if I was outside myself…my hands, helping my daughter, looked just like my mother’s did when I was a child. There’s logical explanations about all these things; nature and nurture and genetics and such things. But I think it’s a gift, no matter how unsettling it may seem to hear your parent speaking from yourself. It is a reminder of our connection, from generation to generation. Our familial ties that occur, sometimes even without common genes. Think of the children who look just like their parents in spite of being adopted. Of children raised apart who live nearly duplicate lives. Of how siblings can have identical mannerisms. Proof we are all one. Back in my teaching days, I loved it when a person would come to conferences and I knew who’s parent they were, simply by their appearance. But when a mom or dad sat down and my student’s voice and mannerisms suddenly appeared, that was even more magical. I love proof of how families work and are. Perhaps my love of these things is because I’ve never felt I look like my family. That isn’t 100% true, of course, but I’ve always felt a bit of the odd duck. I’m the shorty of the family, etc. etc. And yet, as I’ve gotten older, I see more and more of my mother in me. Take this photo from a few years ago, for instance. 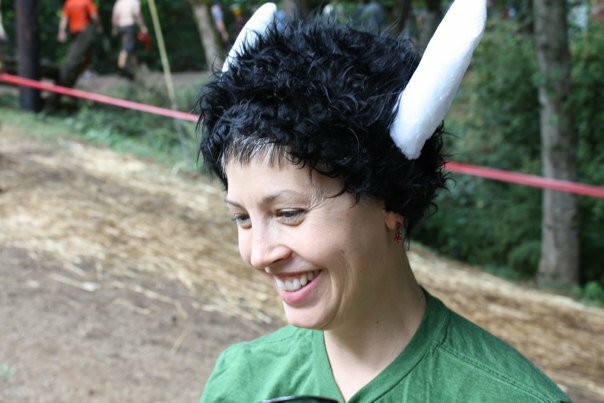 Yes, it’s a bit goofy as I’m wearing Mister Soandso’s “Warrior Dash” helmet, but I love this photo. So many things about it strike me as I look back on it. Those are my mother’s laugh lines. The way my neck is turned, my nose. In my mind’s eye, I can see my mother in just this way. It was about 1980 or so. She was standing in the yard, her permed hair poking out beneath a hat. She was looking down and smiling. And she looked so much like I do, so many years later. Two women, caught in a moment, and their connection so apparent. When I saw this photo, it was so affirming to see my mother. To be reminded that I am hers and that she is mine. To be reminded of the power of family and connection. Some day, my own children will see a bit of me in something they do, hear my voice in something they say. I hope it comforts them instead of troubles them. I hope they, like myself, see it as a chance to feel connected to the mother who loved them so much. This entry was posted in family, Front Page, parenting and tagged family resemblance, parenting, sound like my mother by kristina. Bookmark the permalink. The older I get the more I see it’s a certain bit of continuum, this life / generations / progress, spiritual evolution, etal. Thanks for sharing this, Kristina.